Remember the other day when I toasted some chickpeas (aka garbanzo beans) and said I’d love to really roast them? Well, I found this recipe on Kalyn’s Kitchen for Crispy Roasted Chickpeas with Moroccan Spices and got to experimenting this afternoon. I have quite the collection of spices in my pantry so I didn’t shy away when I saw the list! Plus, all of the spices listed seemed like the perfect way to add a little pizzaz to these high protein beans. Speaking of spices, a little side story. For as long as I can remember my mom has had her spices alphabetized in our pantry. And since I’m a total scatter brain I never really thought alphabetizing my spices would be something I’d do. So fast forward, through my entire life, up until a couple months ago. I was on vacation and my roommate sends me a text saying she was cleaning out her shelves in the pantry and asked if it was okay if she alphabetized my spices. I was all “uhhh, sure? I mean, if you really want to?” thinking it would last all of a day once I came home and messed them up. I was also thinking I’d never offer to alphabetize anything for anyone since I still recite the alphabet out loud to figure out which letter comes next. You do it too… don’t kid yourself. Let me just say this now, besides organizing your jewelry in a really cool way, alphabetizing spices is probably the best way to make your life easier. It’s been months and I can’t imagine how I ever cooked with them all scattered about. Drain the beans in a colander and rinse well with cold water. Let the beans drain for about 5-10 minutes then pat dry. 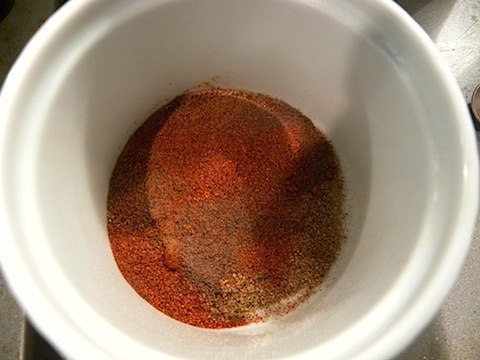 While you’re waiting for the beans to dry mix together your spices to create the Moroccan Spice Mix. Spread the beans in a single layer on a baking sheet and toss with olive oil, Moroccan Spice Mix, and salt. Roast for 30-40 minutes or until slightly browned and as Kayln says “until they make a rattling sound when you shake the baking sheet”. Serve fresh out of the oven or let them cool a bit. As someone with a nut allergy these are the perfect substitution… The texture and consistency actually reminded me a bit of a roasted peanut. I was also thinking they’d be the perfect little snack to serve at a party. All of the warm flavors from the spices reminded me a bit of Fall too! 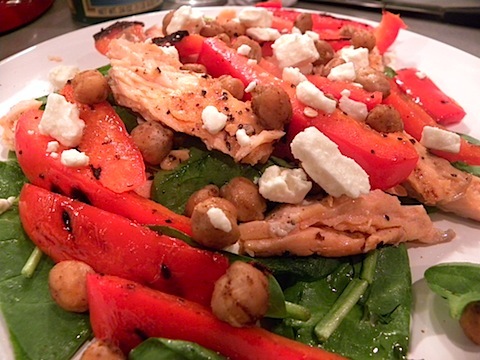 For dinner dessert this evening I made a spinach salad with grilled salmon, roasted red peppers, Athenos feta cheese, and I tossed on a handful of the Crispy Roasted Chickpeas with a squirt of lemon juice! 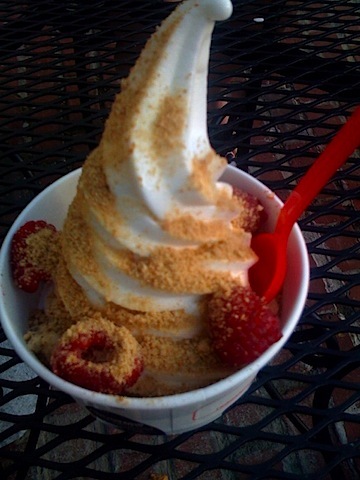 Key lime pie frozen yogurt, graham cracker crust topping, and raspberries from Red Mango. Obviously the best dinner known to mankind. Do you alphabetize your spices? 22 Responses to "Crispy Roasted Chickpeas with Moroccan Spices"
Yes to eating dessert for dinner. Bad habit! There was someone in the blogoverse who roasted their chickpeas in cinnamon and sugar. Does that count as dinner for dessert or dessert for dinner? I think my husband would like your chickpeas, yes, I do alphabetize my spices – though I need another cabinet for them. And No, I never eat dessert for dinner and dinner for dessert, because I might decide I like dinner too much, go for seconds and skip dessert all together. Great idea to alphabetize your spices! As of now, all of mine are scattered on a lazy susan in a cabinet, and yes they are a mess ;). 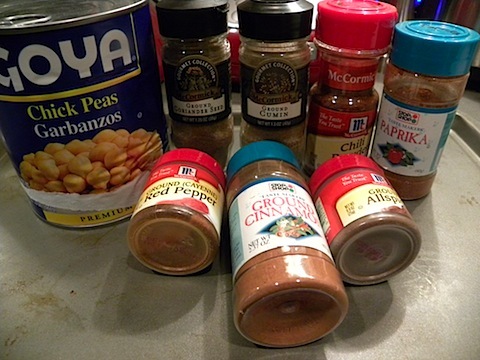 I’m intrigued by Moroccan spices – the chickpeas look great! I have yet to go to Red Mango, but I am planning on treating myself to “lunch” at BerryLine today after the gym :). The roasted chickpeas look AWESOME! I don’t alphabetize my spices…but I should! Love crispy chickpeas – this makes me want to go home and bake some up! I don’t alphabetize, but I do use a spice rack and categorize them (ex. everyday spices, exotic, sweet, etc.). Um no – But I kinda want to alphabetize them now! Yes – on occasion. sometimes you gotta give in to the cravings. plus, it’s what being an adult is all about – the fact that you CAN eat dessert first whenever you feel like it. Alphabetizing spices?? What a GREAT idea! I can’t wait to try this!! How do you have the space to alphabetize your spices?? Mine take up 1 entire cabinet (3 full shelves… I may have an addiction). At one point they were separated by “specialty” “sweet” and “savory”, but even that only lasted a month or 2. Looks delicious! I tried something similar with cayenne and lemon zest and it worked out well, but I’ll give this recipe a try next time. I don’t alphabetize my spices…I organize them according to their major use…for example, I keep my baking spices together, my spicy spices together, my Italian, my Greek, my Asian, my all-purpose/ everyday spices, etc, etc. I always seem to know exactly where to find what I want as long as no one moves them around. 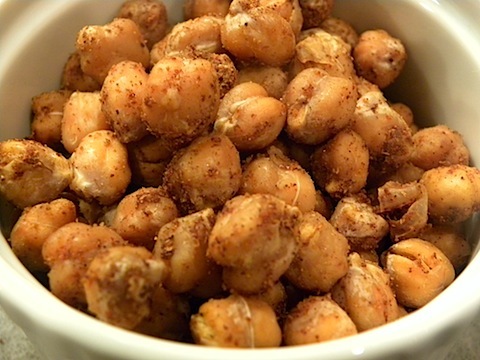 Thanks for the great recipe for the Crispy roasted Chick Peas…I really want to try them. I definitely need someone to come over an alphabetize my spices..and also to tell what what some of the mystery ones are hanging out in little baggies. Those chick peas look scrumptious! ok, LOVE! this is on my list for tomorrow to try! I never knew you could start with canned beans. I should alphabetize my spices – they are such a mess! The chickpeas look so tasty and addicting! I have a really large pantry with double doors… it’s pretty deep so I just have the spices alphabetized in several long rows. I’ll try to snap a photo and post soon so you can see! 🙂 I also have a spice addiction! I refuse to NOT make a recipe if it calls for a specialty spice so I’m always buying them! 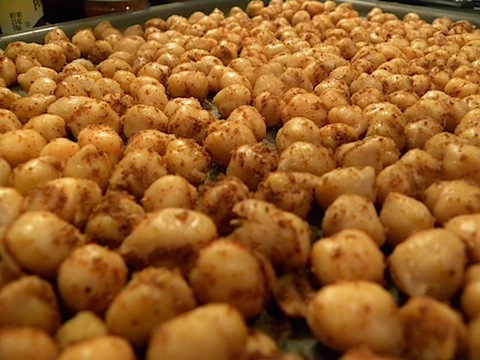 I think roasting chickpeas with cinnamon and sugar counts as… breakfast AND dessert? HAHA… YUM! I’ll have to try that out! I organize spices and ingredients in plastic shoe-box tubs by cuisine. Spices-I have “sweet” spices on one shelf in the pantry, and other often used spices more by category. I have one whole double decker stainless spinaround of peppers! DH is a nut for salts-Salash smoked, Paprikash, pink, black and so on. I am going to expieriement with various flavour combos for the garbanzos……Thai…….. South Indian……….Ethiopian……oh Berbere is my favourite so far. I also like using some smoked salt on them with the spice combos. So much healthier than fried. I use peanut oil and a drizzle of sesame on some combos as well as my fav EVOO. Well, not only did I alphabetize my spices after many many many years of having them on lazy susans in the cabinets above my stove where I could never reach them and find what I needed, I discovered these spice racks that fit in a drawer from The Container Store — so not only are they alphabetized but they are right in front of my face! The down side is that 2 racks holding a total of 24 spice jars is not enough to contain all of my spices, which are in another cabinet on step shelves — unalphabetized :0 However, those are the ones I don’t use as often. I am going to try this roasted chick pea recipe tonight! Saw a similar one on the Weight Watchers website. Looks awesome! Yes! I’m married almost 40 years and have ‘been alphabetizing’ them almost from the early days of my marriage.I have encouraged friends and family to do the same over the years. I have two wooden spice racks, each holding 30 spices, made for me by my father many years ago. I treasure the racks, as well as the herbs and spices they hold. The racks are in a small pantry, away from heat and light. It’s so important to care for them to maintain freshness and shelf life. On the shelf below I have two plastic containers. One holds Spanish herbs and spices and one holds Thai and mid-Eastern herbs and spices. In addition, in my pantry baking cabinet I keep cinnamon, nutmeg, ginger, allspice, as well as lemon and orange zest. I have a shelf devoted to various oils and on the rack above I have basil, oregano, garlic salt, powder and juice, onion salt, powder and flakes. This system works wonderfully well. I am able to access whatever herbs and spices I need in a flash. I purchased a package of dried chick peas yesterday. I soaked them overnight, drained them and cooked them slowly for an hour and a half. It made an equivalent of four cans for half the price. Today I will try your delicious- sounding recipe, make hummus, and use some in salads. Love this recipe! I definitely eat dinner for dessert sometimes, but only out of guilt 😉 If I’ve eaten dessert first, I feel obligated to follow it up with something marginally healthy.